Add the spice packet that came with the corned beef. 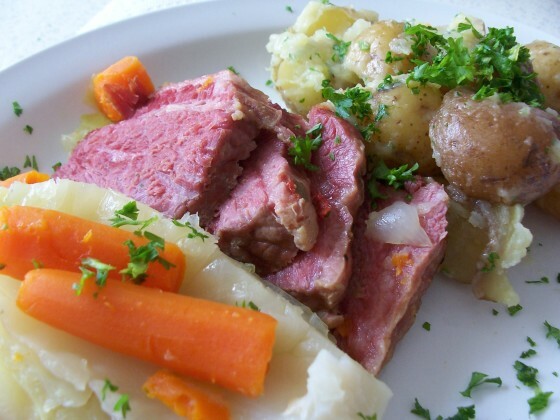 If the corned beef did not come with a spice packet, use the peppercorns and bay leaves instead. Cover the brisket generously with water and a bottle of beer (beer is option, however, it does add flavor and is a tenderizer). While the meat is simmering for those two hours, scrub and rinse the red potatoes removing any eyes and bad spots. You will want to leave as much of the peel as possible. Once cleaned up, quarter the potatoes and cover them with water until you are ready to use them. Remove the outer leaves form the cabbage until the leaves are antirely light green, rinse and cut into quarters through the spine so they stay together. Set aside. Peel the carrot and cut it into quarters. Set aside. Rince the bunch of fresh parsley and chop up just the tops into very tiny pieces. After your corned beef has been simmering for two hours, add the potatoes on top of the brisket. Check the cabbage to see if it is tender. If not, simmer for another 5 minutes. When done, in a large serving bowl where you can sitr the potatoes, crush the garlic clove and rub the inside of the bowl with it. Place the potatoes in the bowl while still piping hot and add at least a quarter pound of butter and a handful of the fresh parsley. Gentley stir until butter is melted, it coats all the potato pieces and the parsley is evenly distributed. Put the rest of the parsley into a single serving bowl for anyone who may want to ad more.